The "Tatty" body care, and household products. Cleaning agents as they should be, optimum price / performance ratio, with a strong grease cutting power and biologically degradable. 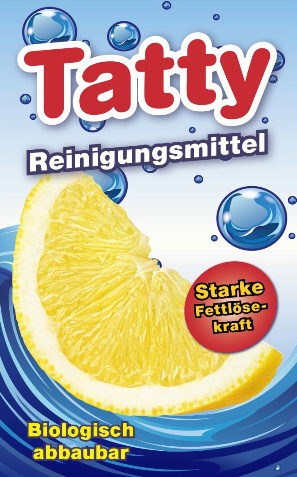 Die "Tatty" Körper und Haushaltspflege Produkte. Reinigungsmittel wie Sie sein sollen, optimales Preis-/ Leistungsverhältniss, mit starker Fettlösekraft und Biologisch abbaubar. And us to your chanel list.